Diesel is a tad more genial here than we're used to, but there's no getting around the fact that he sticks out like a sore thumb. Ang Lee's sincere take on satirical Iraq War novel favors bleeding-edge technology over blood and guts to a fault. That makes Billy Lynn's Long Halftime Walk an absorbing character study, even if it's ultimately not one that justifies its much-vaunted technological advances. 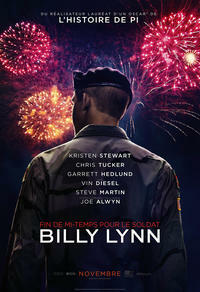 Billy Lynn's Long Halftime Walk is a tremendous show of the human spirit, that uses technical magic to heighten its reality and put us in the middle of the action. The end result is nothing short of impressive.